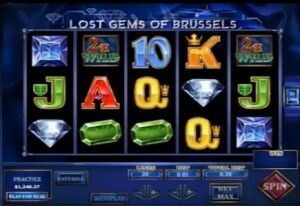 Top Game, an internet gaming software company just released its latest video slot called Lost Gems of Brussels. Top Game has been involved with online gambl ing for the better part of 4 years and has managed to compile a game library of more than 50 games to date. They focus on interactive games for players around the world in legalized markets only. Lost Gems of Brussels is a 5 reel video slot that offers 20 paylines. It is based around a number of jewels that have gone missing in Brussels. The irony of this slots release is it comes on the heels of a recent robbery in Brussels that saw $50 million in diamonds being stolen. The game offers wild symbols, multipliers and free spins. This is a standard offering for most games under the Top Game software and it would be a positive step forward to see some new features being released under this software. Lost Gems of Brussels can be played at any Top Game facing casino online today. Iowa supporters of online gambling saw yet another set back with the bill from Senator Jeff Danielson’s failing to pass the Senate subcommittee. While the bill had been moved to the Senate subcommittee it was quashed in a 2 to 1 vote. This is the third attempt to get this bill approved and the third attempt state legislators have killed it. There was support from many different parties involved in the states gambling industry including the Iowa Gaming Association. The reasons being given for the defeated bill is that there are other more pressing legislation that needed to be debated and that time for the gaming bill wasn’t ion the books per say. The Iowa Gaming Association stated that recent developments in New Jersey, Nevada and Delaware and the reality that many residing in the state already gambling with offshore betting companies is reason enough to get this bill passed. Recent polls show that more than 70% of those who responded to the poll were not in favor of the bill and this was used to justify the bill not moving forward by state subcommittee. The state of Hawaii is also trying to see the legalization of online gambling recently. January of 2013 saw another attempt made however almost no progress has been made and it is expected to fail. The bill is not officially dead yet but there is little support for it at this time. This is disappointing when you consider the bills approved in a number of U.S state recently.